Middle School The worst days of my life, process of a shot. Duncan Studios had kindly shared this in their Facebook page. It was one of the many shots I had animated for this feature film. Was a very challenging shot due to the match of CGI camera move and 2d traditional animation. A lot of love and effort I put on this shot, and it is rewarding to see how cool it looks after the excellent work of comp, BG and FX artists put into it! 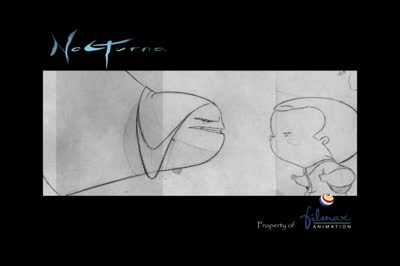 Enjoy some cool traditional animation! Some months ago I worked for Duncan Studios, animating on the upcoming project Middle School: the worst years of my life. It was a blast to work with Ken Duncan and Chris Sauvé, whom was animation director, a very good one by the way! All the team at Duncan Studios was great, so…..only great things can come out of that! I leave here a link to AWN article about the feature film, and a featurette showing the animation process and such. Happy to see some of my shots there! Like the one of Rafe (the kid) sitting at a table and the bear put the pawn on the hair and leave it full of honey. and several more, but…..just enjoy the whole thing, go see the movie when it comes out!, the animation on it is great, it is gonna be a cool movie. Once movie gets release and all, I’ll ask permission to show some of the rough animation I did for the film. untill then, enjoy the article and featurette! I’m happy to announce that Animation Critique it is up and running! Please check it out and have a look what the site have to offer you! I’m very exited to be part of the team that will review and advice your animation. All artists that are involved in this nice project are passionate by the craft, and we love to see your work and help you improve on it! I want to share here the trailer for the Tv Series Cracke, or Cracked (French or English Title). Cracked was produced and created by the talented people of Squeeze Studios, located at Quebec Canada. I have the Honor to collaborate with them as Animation Director, and credited has Director of one of the episodes. It was a blast of fun to work in this project, and my thanks to all the people at Squezze studios, for their incredible work and commitment to the project! I hope that soon everybody can see the show on TV, so far I know it will in air time at Teletoon Channel. We wanted to bring back the feeling of cartoons from the golden age, but into the present media capabilities, the result it is a fun, entertaining, slapstick action driven comedy, with time enough to put a smile on your face with each episode. Here it is the Trailer, enjoy! Animation I did for a Volkswagen commercial for Method Studios. My part on the project was to animate the horses galloping. Short collaboration, fast passing in the spot, but I hope you all can enjoy some of the animation there! one of the latest spots on where I did animation, specifically the last shot with the couple at the end. enjoy some stylish animation from Glassworks Barcelona.